If the Avengers are a super-powered Special Operations group then Spider-Man is a beat cop. While the Avengers stop Ultron from wiping out all human life on the planet and prepare for the world-shattering invasion of Thanos, Spider-Man helps old ladies with directions and stops bike thieves. That is as it should be, for Peter Parker is just a kid, and cannot handle the responsibilities that come from being part of an elite paramilitary unit with international jurisdiction. Spider-Man: Homecoming is a great movie, probably the best Spider-Man flick, and serves to highlight the interesting contrasts of the Marvel universe. It’s a movie about a small-time superhero with big ambitious. Spider-Man is a kid who wants to be an adult, and a beat cop who wants to be a Navy SEAL. People argue the current run of super-successful live-action superhero flicks kicked off when Christopher Nolan updated Batman in Batman Begins. Not so. Sam Raimi’s 2002 Spider-Man proved, for the first time in a decade, that superheroes could bring in the box office bucks. The timing was, tragically, perfect. In the summer of 2002, America was still reeling from 9/11. The attack that pushed America into two decades of perpetual war wasn’t even a year old when Tobey Maguire swung through Manhattan. Audiences were ready for a hero to save the day. He did, but despite one strong sequel from Raimi, the webslinger has languished in commercial disasters while he watched lesser-known heroes such as Thor and the Guardians of the Galaxy become cultural phenomenons. Thank god Marvel is back in charge. I loved the first two Raimi movies, and though Andrew Garfield and Emma Stone’s onscreen chemistry was magnetic, they couldn’t save director Marc Webb’s terrible Amazing Spider-Man franchise. No longer is Spidey slinging across Manhattan while trying to take down strange electric monsters bent on destroying the whole city. No, Spider-Man: Homecoming shows us the character as he should be — a kid trying keep his neighborhood safe. Let’s get the basics out of the way. 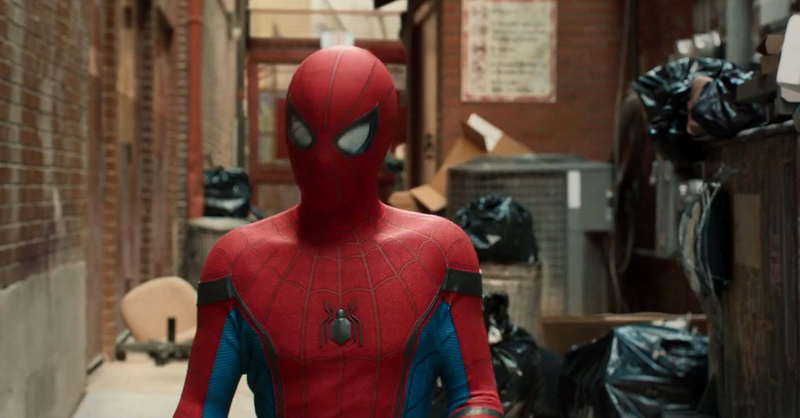 Spider-Man: Homecoming is easily the best Spider-Man movie, and a lot of that is because of actor Tom Holland and Marvel’s decision to forgo the origin story. By now, Spidey’s origin story is as well worn as Batman or Superman’s. Hell, even The Sopranos quoted doomed Uncle Ben without explaining the reference. So Homecoming assumes the audience either knows or doesn’t care about how a scrawny kid from Queens came to hold such awesome power. Which allows the film to fill its first hour with character development, comedy and action. Spider-Man’s best stories mix the tension of managing the character’s life as Peter Parker with his life as a hero, and the tension works best when the stories take place in high school. Fortunately, Holland and Parker’s classmates actually look, walk and talk like teenagers. The rest of this article contains spoilers for Spider-Man: Homecoming. If Homecoming just hit the proper beats of a Spidey story it’d be great, but the social commentary hiding just under the surface makes it a classic. Marvel has done an incredible job of making fun, light and entertaining movies. But I think future generations will remember this run of films in a way they won’t recall other big franchises such as The Transformers or Pirates of the Caribbean. Guardians of the Galaxy Vol. 2 asked what it means to be a father. Captain America: Civil War asked the heroes to face the consequences of unilateral military action. Avengers: Age of Ultron watched the heroes reckon with the legacy of World War II and the Cold War. With Marvel, there’s a surprising amount of depth just below the surface. Spider-Man: Homecoming is no different. Michael Keaton’s Adrian Toomes is the movie’s villain and he’s one of Marvel’s best. At the start of the film, he’s running a salvage company and picking through the wreckage the Avengers left behind after the Battle of New York. Despite his agreements with the city, Toomes’ enterprise falls apart when a federal agency led by Tony Stark — the Department of Damage Control — steps in to pick up the pieces and muscle out the small business owner. “The assholes who made this mess are getting paid to clean it up,” he moans later. Toomes is a stellar villain because he’s sympathetic. We understand his motivations. He and his crew steal from Damage Control to put food on the table, not to dominate the world. They’re small business owners striking back against a federal system that screwed them over. Parker is an appropriate hero to fight Toomes because he’s a local hero who wants, desperately, to be part of that federal system. In any other movie, he’d be the villain and Toomes would be the hero. But Parker’s a kid with disarming charm and a heart of gold, so it’s fine. But anyone who has worked with law enforcement knows the type of cop I’m talking about — he’s the guy who collects guns, reads military magazines, gets excited with every new 1033 acquisition and never quite made the jump to the military. There’s a lesser subspecies of this type who aspires to be a cop but couldn’t hack it and becomes a security guard. There’s nothing worse than a mall “cop” who wants to crack skulls. Some of these cops are good at their job, some aren’t, but all wish they were actually soldiers fighting on a battlefield instead of serving and protecting a community. As American policing has become increasingly fraught, we’re seeing more and more of this type of cop. Think of them the next time you see your local police force roll down the highway in a Mine-Resistant Ambush Protected vehicle. Marvel’s new Spider-Man is just like them. He likes patrolling his neighborhood, but he’d rather be an Avenger. Every chance he gets, he contacts Tony Stark and begs to play soldier with them. He knows he could do so much more, if only they’d just let him. But he’s not ready. Not really. He’s a friendly, neighborhood Spider-Man and that’s where he should stay. He’s only 15. When we learn that the super-powered suit Stark gifted Parker contains training protocols and monitors his activities, I thought of police officers wearing body cameras. But, as both Stark and America have learned, mass surveillance of the police only works if the cops can’t turn the cameras off. There’s reason to believe it doesn’t even work then. “I’m nothing without this suit,” Parker tells Stark late in the film. He just screwed up big, and almost killed hundreds of people because he wouldn’t listen to Stark — the federal authority to Parker’s beat cop. “If you’re nothing without this suit,” Stark replies, “then you shouldn’t have it.” Which is a neat update to the old line about power and responsibility. It’s also a message some Americans would like to see delivered to an ever-more militarized police force. If you’re nothing without the badge, the MRAPs, the body armor and the military occupation tactics … then perhaps you shouldn’t be policing at all.